Flying home. 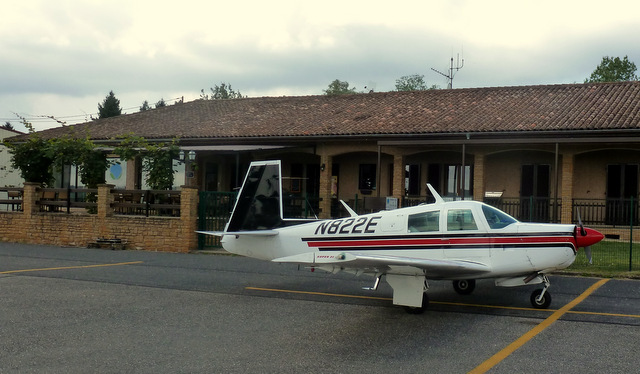 | Flying a vintage Mooney across the Atlantic to France. 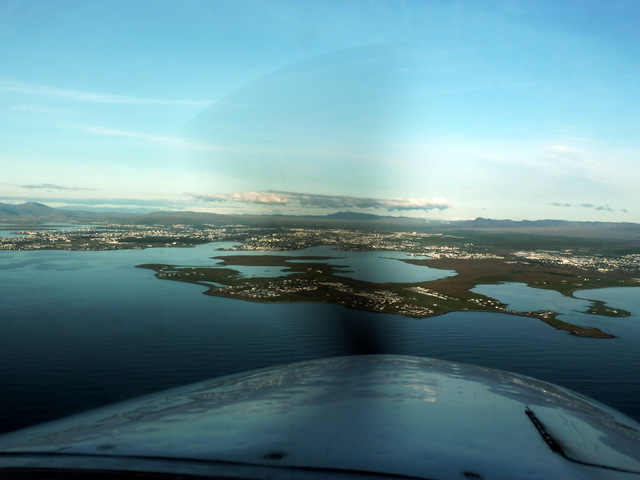 Flying a vintage Mooney across the Atlantic to France. I couldn’t fly on Tuesday, as the aircraft was low on fuel, the airport didn’t have any, and the weather conditions were low IFR all day. 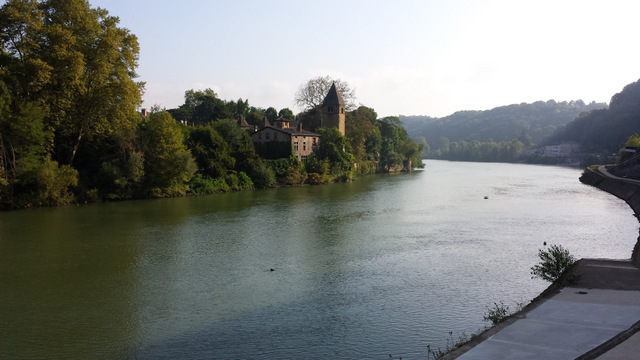 But after the early morning fog cleared yesterday, I made the short flight to Auxerre for fuel, and then the final hour back to Villefranche, dodging the clouds that were building fast over the hills and arriving home just before lunchtime. 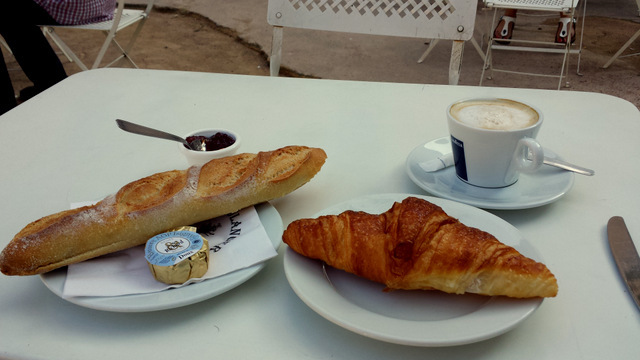 And culminates with croissants, fresh bread, home-made jam and strong coffee. 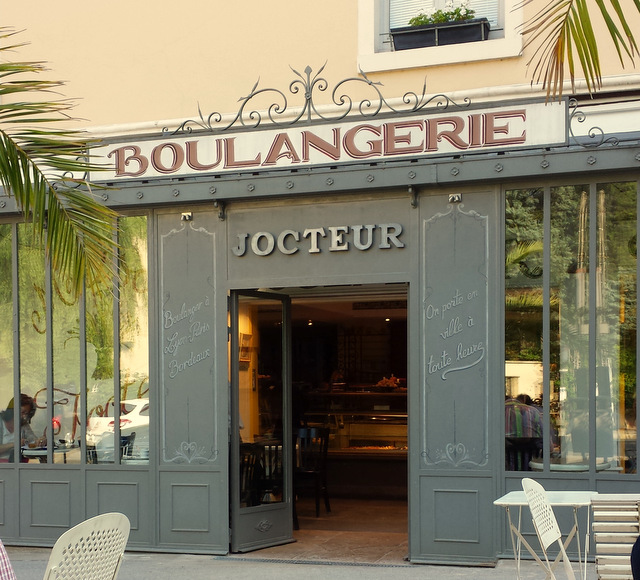 Were the croissants as buttery as I remembered? Were they worth flying 4,700 miles for? Absolutely. Thanks to everyone for reading, and sharing the last two weeks’ adventures. I will add a page soon with some technical details of the trip, and some useful links. Well, N822E and I have made it to France! In fact, we have made it to about an hour from home. And here we may be staying for a bit! I left Oxford late this morning, and after a scenic tour of the South coast of England (no photos – without Joe to hold the controls I was busier today!) and 100 miles or so trundling through wet clouds, I landed in Troyes – a useful airport in central France, with customs on site. It would, of course, have been best if I’d remembered to give customs advance notice… but once again, my Delorme tracker came to the rescue, and a quick in-flight email to my friend Ian sorted out the administrative oversight. 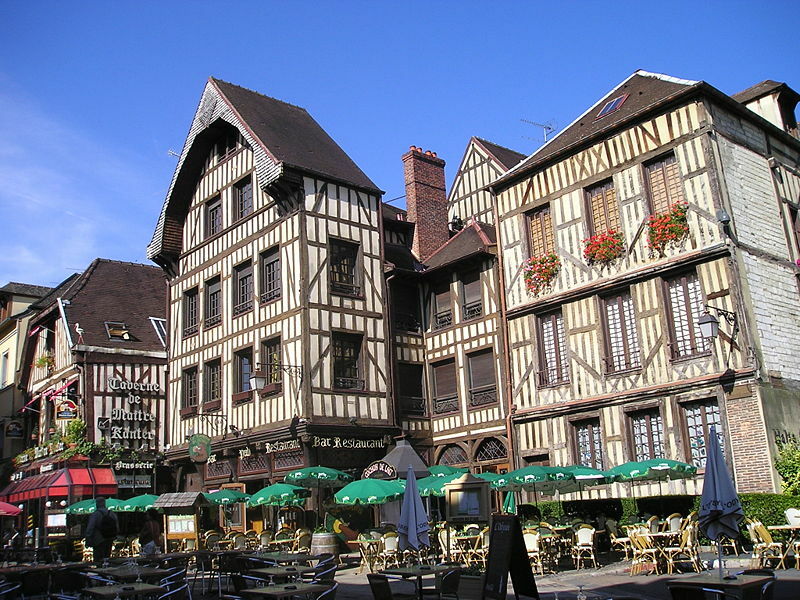 I spent a bit of time on the ground looking at the weather, and a bit trying to work out a route from Troyes to Lyon that would be accepted by the European IFR flight plan computer, and finally a bit more talking to the meteorologist from the Météo France office at Troyes. In my months away from France, I fear I must have forgotten how to speak French. 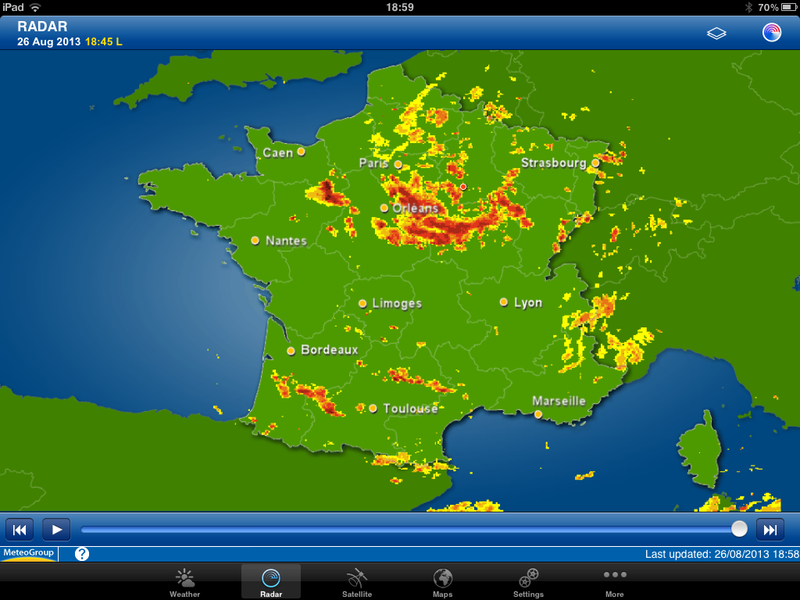 Because I understood the meteorologist to say “it will be cloudy and a bit wet for the first half of the flight to Lyon, but there are no risks of storms”. Whereas what she must actually have said is “there’s an impenetrable line of storms blocking your route, and if you take off you’ll end up back here wondering why you bothered”. Which is what happened, an hour after takeoff. After landing, and checking into the airport hotel – and finally getting decent internet access – I took a look at the weather radar. I was trying to get from the little red dot, down and to the right of Paris, to Lyon – via the Euro-computer route which goes South and a bit West for 100 miles. Looking at the picture, it’s not surprising that I didn’t make it! For American readers, France is different. It is still August, when the whole country basically shuts down. And one small result of that shutdown is that Troyes airport has run out of fuel. The tanker driver is on holiday. And one small result of my flight to the storms and back is that the Mooney doesn’t have much left in the tanks. Tomorrow’s weather looks like being dismal all day, which means carrying a healthy fuel reserve if I try to leave, so I think there is a real possibility that I may have to wait here until Wednesday morning. Taking the scenic route to London. Yesterday dawned wet and windy in Reykjavik. But on the weather charts we spotted a very rare phenomenon: high pressure and clear skies over the Faroe Islands. The choice was made. 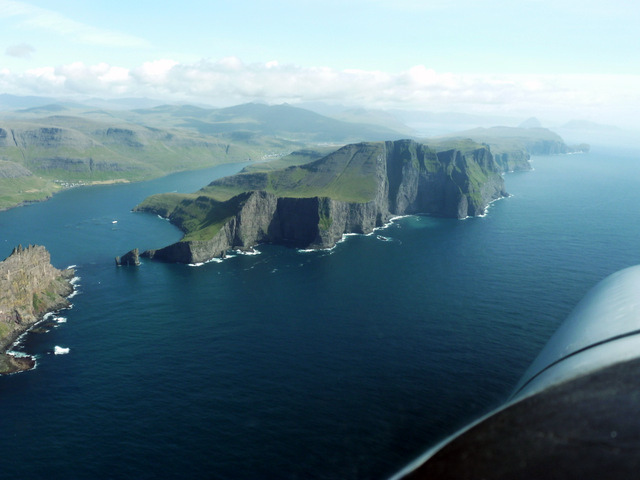 We scrubbed our plans for a direct flight to Scotland, and planned a flight to Vagar. We took off in a rain shower below a low overcast, with the wind gusting to 25kt. Just as I was about to say “I’m glad I don’t have to land in this”, Joe said “The oil filler flap has come open.” So we made our shortest flight of the journey, I made a passable landing, and we were soon underway once more, bumping through the clouds trying to stay below the freezing level. The airport is the other side of the cliffs. Turn left at the waterfall. 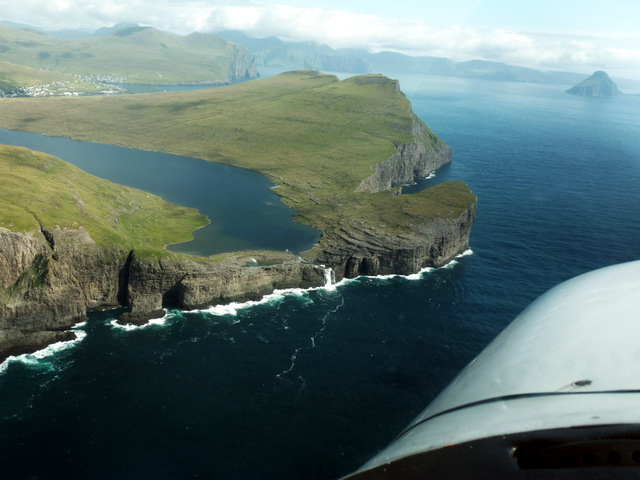 Past the town of Vagar.. The refueller was rather disappointed that we didn’t need his services, but we had filled up in Iceland and had plenty left to get to Scotland. We paid a quick visit to the tower to file our next flight plan, which turned out to be unexpectedly problematic. Flight plans in Europe need to be validated by a computer in Brussels, and the lady in the tower couldn’t get the computer to say yes. Joe and I should have used one of the very handy apps that produce acceptable routings – we will know next time! However, the tower lady reassured us that she knew how to make it work and we were told to expect our clearance after we took off. Well, of course, we never got any clearance. 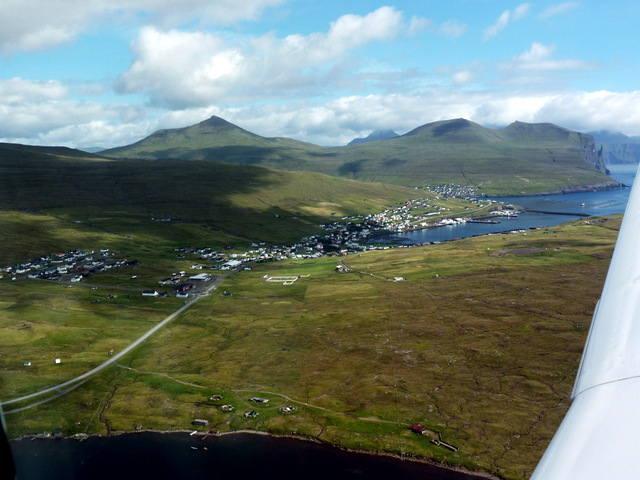 We very quickly lost contact with Vagar, and despite the assurances we’d been given Scottish air traffic control was never told that we were coming. A bit of negotiation over a very crackly radio sorted everything out, thankfully, and after a couple of hours we made landfall over the Outer Hebrides. Sadly the good weather ended at the Scottish coast, and we were soon flying in and out of cloud, getting only fleeting views of the sublime scenery below. Joe handled the radio for this flight, but his many years as a professional pilot had left him totally unprepared for the eccentricities of British airspace and air traffic control. I think this would probably be the hardest part of the whole trip for anyone who hadn’t previously flown in the UK, which is sad. Joe was rather more favourably surprised by the immigration controls when we landed at Prestwick. I had emailed his passport number to immigration before we left Iceland, and as he isn’t on anyone’s list of evil-doers (I sent my email before he left the oil filler open! ), no officials came to see us in Prestwick. On the ramp in Prestwick. 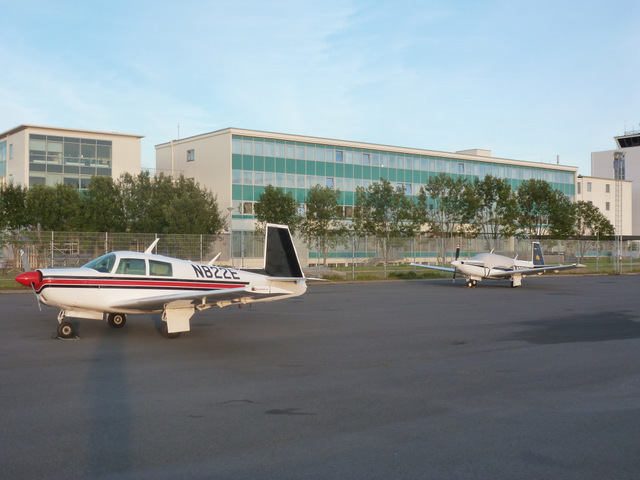 We returned our rented life raft to the very helpful RSS Jet Services in Prestwick, and with help from our friend Steven managed to file a flight plan for our final flight to Oxford. And the computer in Brussels was happy. We then had 2 hours or so of nonsense flying South, with multiple re-routings, multiple changes of controller, some of whom had no idea who or where we were, and basically everything done to complicate what should have been a very simple flight. 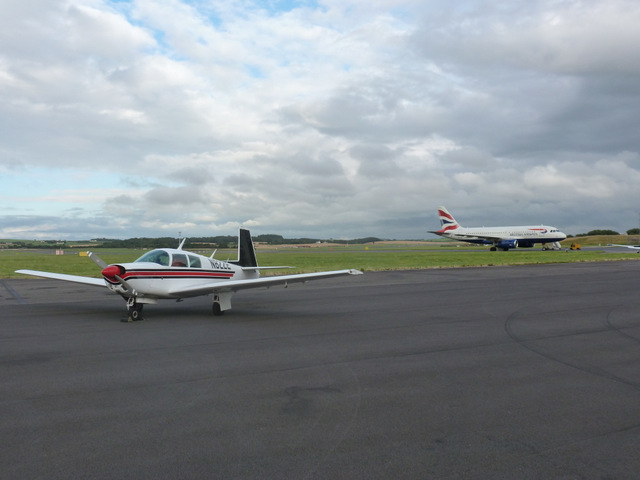 We landed in Oxford as it got dark, and the Mooney will stay there until the import formalities are completed. We caught the train to London, and booked Joe a flight home using some of my airmiles. And – lucky thing – he got a special last-minute business class offer – rather more spacious and relaxing than Mooney class! Before he left for Heathrow a couple of hours ago, he emptied one of his bags and donated some of his unused flight equipment. He was clearly expecting some bathroom emergencies, so I am now the happy owner of 15 sets of adult incontinence underwear! That’s it for now. The final leg home to France will happen some time in the next few days. Thanks to everyone for reading, and thanks especially to Steven, David, Ian, Ann, Frank, Joe T and everyone else who tracked us and sent us messages during the flight. You kept us informed, safe and entertained. 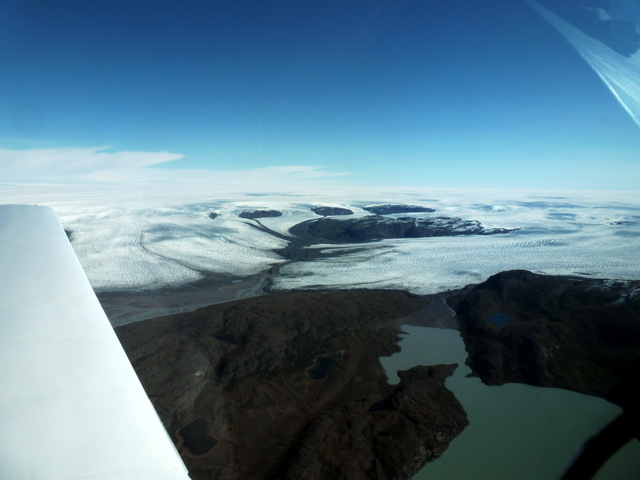 Over the ice cap to Iceland. The morning weather in Sondrestrom was perfect, and a lengthy discussion with the on-site meteorologist suggested that conditions would be mostly good for a flight over the ice cap. Some cloud for the second half of the crossing, but we were told we should be able to remain clear. We should then have good conditions for the sea crossing from Greenland to Iceland, before the arrival of a very wet front. And for the next hour and a half, while the good weather lasted, Joe and I were speechless as we watched the desolate, yet magnificent, landscape slip past beneath us. 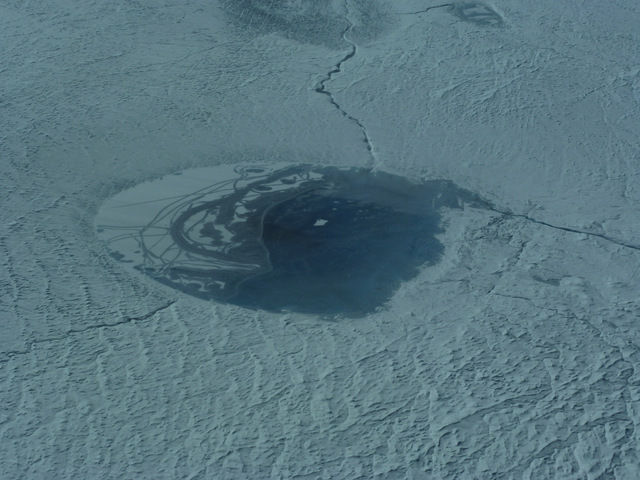 The icecap is deceptive, starting at sea level and rising to well over 9,000 ft on the route we took. We talked briefly to a US Air Force Hercules, equipped with skis, that was visiting a remote weather station, then later to a British Airways airliner who relayed our position report for us. 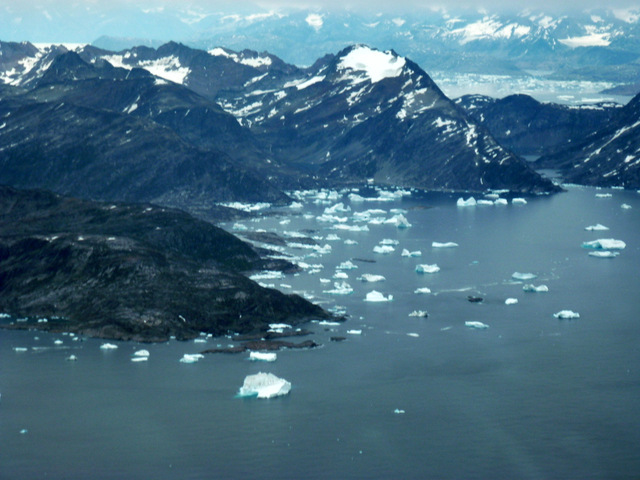 Rocks and icebergs on Greenland’s East coast. 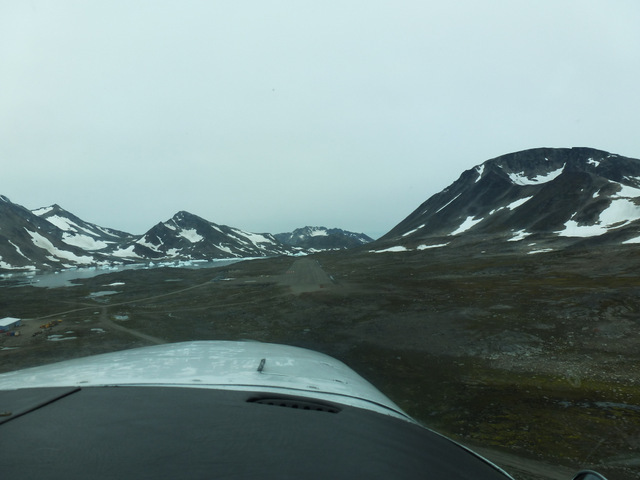 Our destination was the tiny village of Kulusuk, with its gravel runway, where we stopped for a toasted ham and cheese sandwich and some fuel. Turn right at the Iceberg after takeoff! While we were on the ground, the weather had changed significantly, and the cloud base was just above 2000 ft. 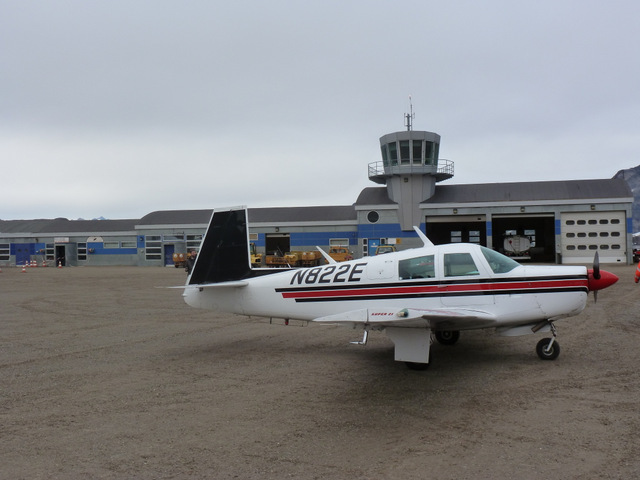 The temperature was cold, so we couldn’t risk climbing – the Mooney has no deicing. So for over an hour we plodded along inside a wet cloud at 2500ft, occasionally relaying our position thanks to passing airliners. 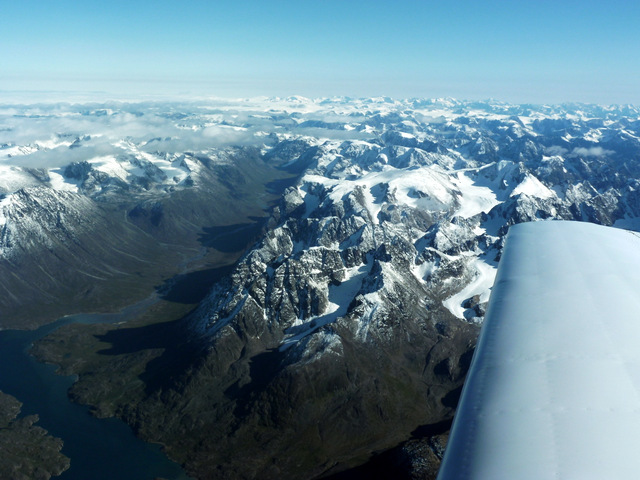 Little by little the weather improved, and we climbed – eventually climbing into controlled airspace and activating our IFR flight plan some 2/3rds of the way to Iceland. As ever, our excellent ground support team provided weather updates and encouragement (and jokes about how miserably slowly we were going – headwinds again!). With about 45 minutes left to fly, we broke out into clear blue skies, and climbed to 8000 ft where we the headwind turned into a tailwind, for the first time since Maine. 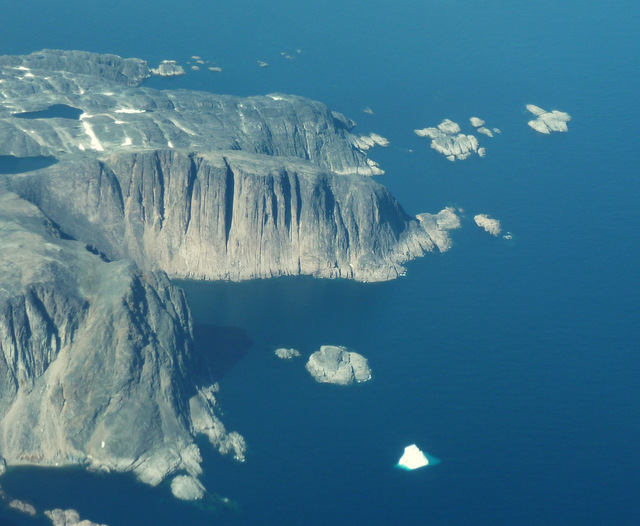 We had confirmed our arrival by email from inside a cloud somewhere near Greenland (today’s technology stuns me). And when we landed, rooms were waiting for us at the hotel just behind the aircraft in this picture. 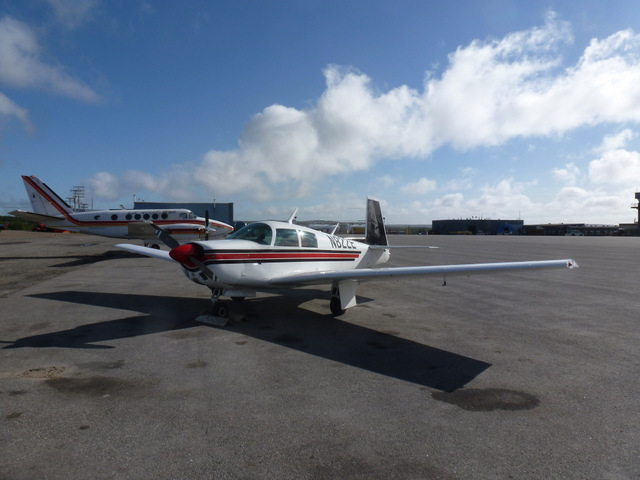 We were parked in front of another, slightly swankier, Mooney – also crossing the Atlantic but rather better equipped for the job than mine. Tomorrow, weather permitting, we will make it to the UK – from where Joe will return to Maine. It will be nice to be back in my home country, after what has been a long time away. 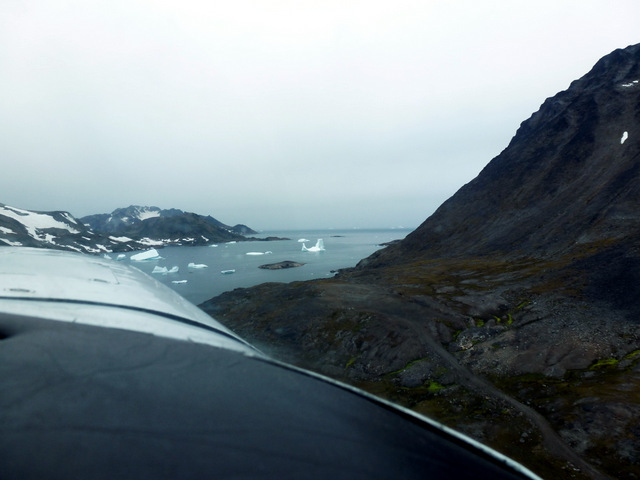 I achieved a flying dream today, by landing my own aeroplane in Greenland! In keeping with the theme of this trip, the day didn’t go quite as planned. We woke early in our excellent lodgings in Kuujjuaq, and quickly came to the conclusion that if we flew to Iqaluit to refuel, as we had planned, there was no way we could reach Greenland before the airport closed at 5pm. There’s a 2 hour time difference, and it’s a long way. So a new plan was hatched. 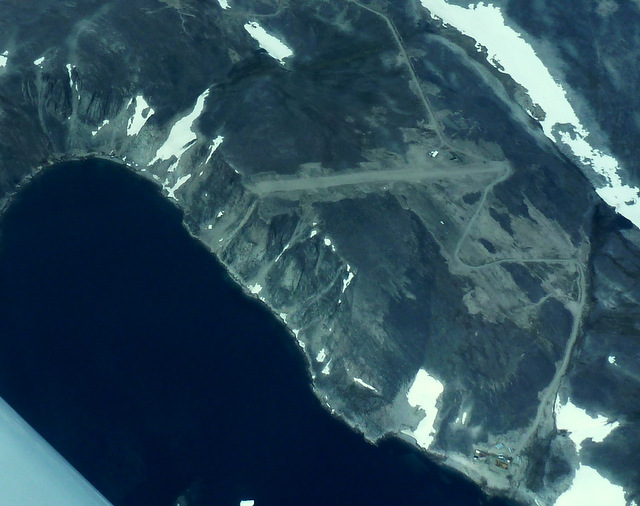 We would fly directly from Kuujjuaq to Sondrestrom. About five hours flying, cooped up in our survival suits. Which is fine – the Mooney can fly for 10 hours with full fuel. But the immediate problem was that I would need fuel in Kuujjuaq. Everyone who has been there had told me the same thing. Don’t buy fuel in Kuujjuaq! But there was no choice. So, I strolled over to the fuel office, which was a little shack surrounded by drums of Avgas, and heaps of cigarette ends, where a very friendly local said he would happily sell me some fuel. We took off, and headed North initially. This was to avoid the Gander control zone, where a High Frequency radio is required – which we don’t have. We had a long time to enjoy the stunning coastline of Baffin Island, thanks to a vicious headwind which slowed us dreadfully. A splendid airfield, which we were tempted to try! At times the wind blew at 60kt from the North West. It began to look as if we wouldn’t reach Greenland before closing time, but we battled on knowing that the strong winds would soon become a tailwind when we turned to the East. Well, as pilots know, the weather gods are a perverse bunch. As we turned East, the wind turned too, and we still had a headwind. And, indeed, for the whole journey today we never once had a tailwind. 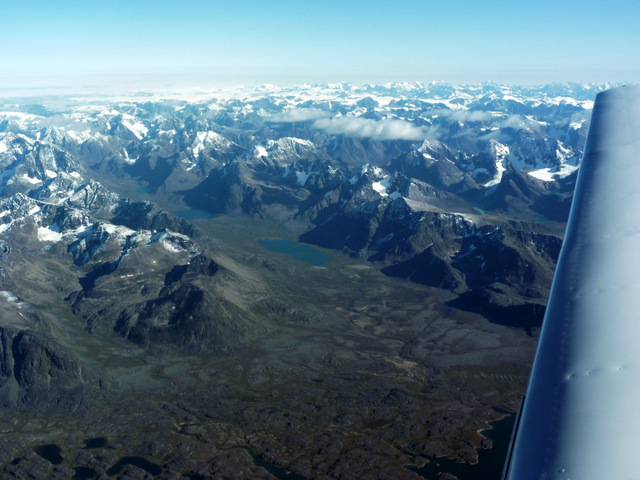 But apart from the winds, the weather was perfect, and the Mooney purred its way across the Davis Strait until eventually the stunning, magnificent coastline of Greenland came into sight. I have spent hours staring out of airliner windows, mesmerised by the beauty of Greenland, so the last hour of today’s flight was pure pleasure. 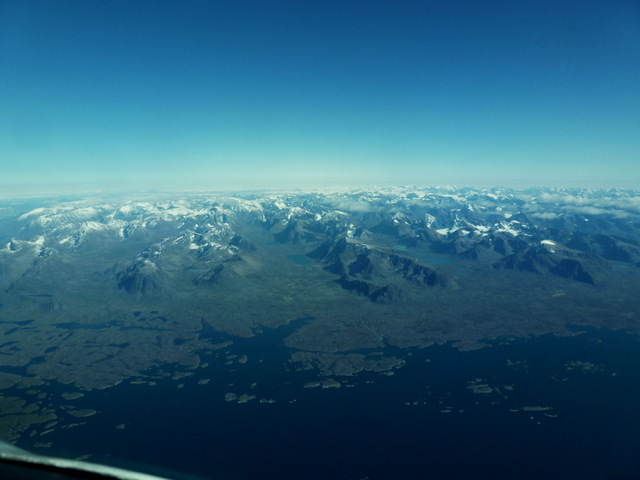 It would have been nice to fly low up the fjord to the airport, but we were trying hard not to be late – and failing. Thanks to the miracles of modern technology, we had our friend Steven contact the airport and negotiate a bit on our behalf. Steven, incidentally, was sitting on a train in England. Being an incredibly helpful chap, he also reserved hotel rooms for us! 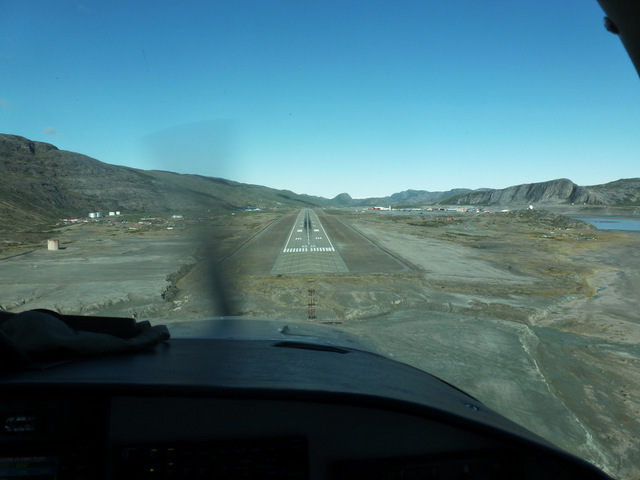 Soon, we were touching down at Kangerlussuaq – formerly known as Sondrestromfjord – after five and a half hours in the air. And we both felt remarkably fresh, thanks to the incredibly comfortable seats in the Mooney – which Joe Thorne had re-upholstered by a friend of his who can work miracles. We felt fresh, but we felt thirsty. We were perhaps a bit dehydrated, due to our desire not to use the on-board bathroom facilities. So, after reaching the hotel we enjoyed a quick drink in the bar, and then a long walk on the path heading East out of the village – towards the ice cap, which is clearly visible just a few miles away. Greenland is a beautiful place. Yet again today, we had a group of friends tracking our progress thanks to our Delorme InReach device, and sending us messages. It is very reassuring to know people are watching out for us, and it always cheers us up to receive messages -whether they are useful ones about the weather, or jokes which can’t be repeated on a family blog like this! 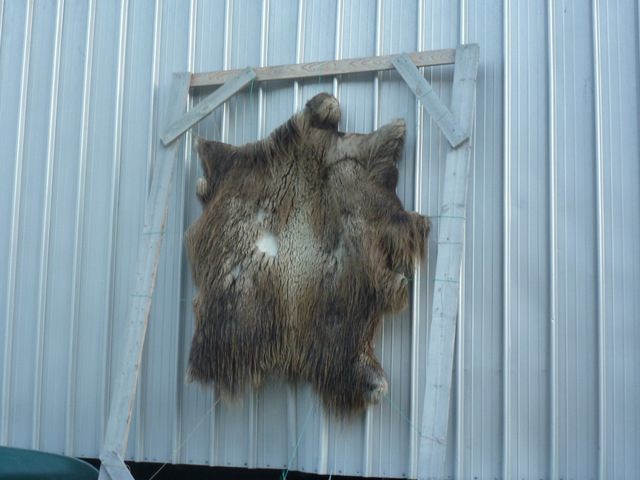 Someone had left a musk ox hide hanging out to dry – possibly the one that we ate for supper when we got back to the hotel. If so, he was very tasty! We haven’t come up with a plan for tomorrow yet, but it will probably involve getting to Iceland. Maybe further, but most likely not. Meanwhile, after a long day, it is time for bed. I took a few, but left my camera in the aeroplane. Sorry! Three of the glowing recommendations I had received for the Inuit community of Kuujjuaq. 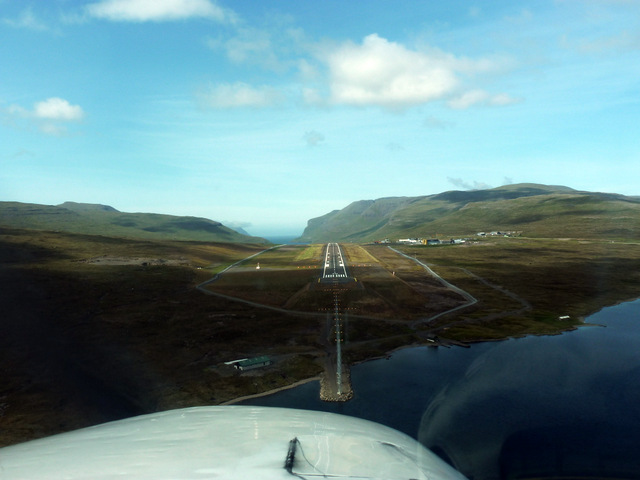 The problem is, it is in a very convenient location, and has a good runway. So we decided to go. As soon as we got with radio range, some 100 miles out, I called them to ask if it would be easy to find accommodation. “Absolutely pas de problème” came the optimistic reply. Oh, and the weather was quite nice too, apparently. Well, in the next 40 minutes, the weather went downhill rapidly, and we ended up flying an instrument approach, with the runway lights coming visible at 500ft, and a direct 25kt crosswind. Sporting stuff. Still, at least there was room at the inn….. we thought. “Sorry, all the hotels in town are fully booked” said the nice man in the control tower. The same nice man who had told us earlier that accommodation would not be a problem. We considered braving the worsening gale again, to fly to Iqaluit, then decided to wander over to the local airline maintenance hangar to see if they had any ideas. They did. And Joe and I are now the only guests in a wonderful, newly built residence that has just been vacated by an aerial survey team. Clean bedrooms and bathrooms, high speed internet, and one pizza left in the freezer – what more could one want? 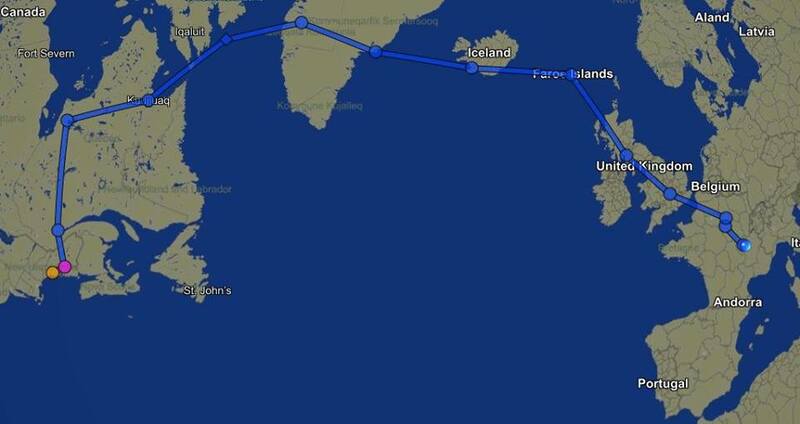 A friend's flight from England to Oshkosh and back.